Alcohol and Smoking-How is it so dangerous during Pregnancy ? 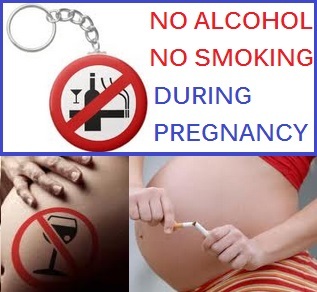 It is advisable for women not to take too much alcohol or smoking cigarrete during pregnancy because these have potential to cause brain damage to their baby or other brain defects .There is no doubt abundant and even moderate drinking alcohol or smoking cigarette during pregnancy damaging. Why you may be aware dangerous of smoking,drugs,alcohol and caffeine during pregnancy?These substances can interfere with your body during pregnancy.Drinking for instance can reduce your ability to conceive. It is not exactly clear just how much you need to consume before your fertility is affected. The excessive drinking can lead to an early miscarriage.If you trying to conceive at the very least reduce your alcohol intake to not more than 1 to 2 units per week which is equal to glass of wine.Like alcohol smoking can affect your fertility. Cigarrete can lower the quantity and quality of your eggs.Egg exposed to nicotine have greater way developing abnormalities.If your partner smokes tell him to quit too since nicotine also affect the quality of the sperm. Drugs can also lower your fertility and the quality of your eggs.Using drugs during pregnancy can seriously harm your child so its best to kick your habit before u get pregnant.